Playing CBT was first developed in 2015. The goal was to help children to understand their emotional experience through play, and to help therapists use Cognitive Behavioral Therapy with children in a creative and enjoyable manner. The Playing CBT game board seems like a regular game board at first glance. However, through its carefully chosen questions, it becomes much more than just a game. It is a means and a tool to facilitate meaningful discussions with patients about characters in their lives, about their thoughts, about their emotions, internalized voices and voices that they wish to internalize, about the way they cope with different situations and more. In this article I present the concept behind each carefully selected question and how to facilitate discussions using the questions on the back of the cards. Stage 1 – deals with events, thoughts, emotions and behavior without the sensations cards and moderating thoughts cards. This is based on the assumption that playing the game in the initial stages of introduction will make it easier to get to know the most basic model. Stage 2 – enables a deeper understanding of the model through the use of the moderating thoughts and physical sensations cards. Later in the game it is also possible to form sequences using the cards for the various associations with which we deal during the game and course of therapy. The questions on the cards were carefully chosen to help participants identify their emotional experience and those of people around them, and to understand the effect of each part of the model on the next. 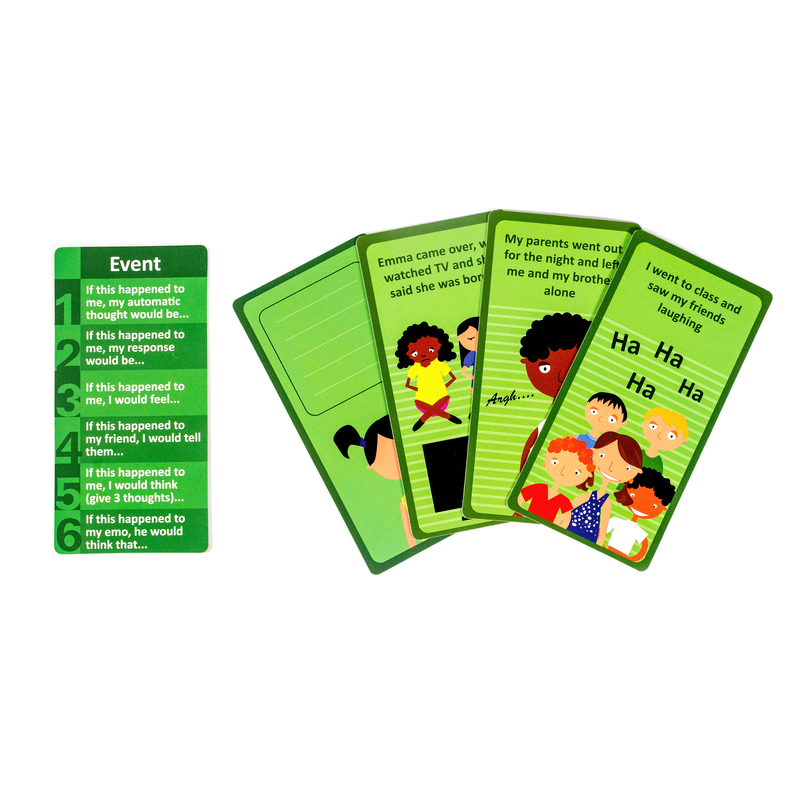 In addition, the cards are also effective when providing explanations to parents. The game’s instruction manual also contains explanations specifically for parents. What is the purpose of the questions and what conversations can you start based on these questions? The purpose of the question “If it had happened to me, I would have thought…” is to teach children, through play and discussion, about the connection between external triggers (events) and interpretations (automatic thoughts), and to get to know the way they think. For example, the event: “I went into the classroom and Vanessa didn’t say hi to me” may trigger the thought: “She doesn’t want to be my friend anymore”. The purpose of the question “If this had happened to me I would have felt…” is to recognize that any event triggers an emotion. Although often an automatic thought arises that triggers emotions, there are also cases in which children experience emotions that do not necessarily follow a thought, but rather a memory of an earlier experience that causes an emotional reaction. Some children allow to explore the matter in a broader way; make sure you notice it. For example, an event such as “I stepped into the classroom and my best friend didn’t say hi to me”. Some children may say that they would feel fine about it since they don’t care about their classmates. Others might say that they wouldn’t be sad about it but their sibling would surely be crying, allowing us to recognize the emotional mode of that child’s environment or a part in them that is currently represented by their sibling. The question “If this had happened to me, I would have…” examines our coping style when we experience triggers in everyday life. Children tend to share similar situations from their daily lives. This is our opportunity to identify the child’s coping style, and examine with them whether this behavior is effective in the long run or whether it is an automatic reaction disregarding future results. The question “If this had happened to my friend, I would tell them…” refers to thinking from a friend’s perspective. A good technique to develop cognitive flexibility is to examine a situation from the perspective of another person. The purpose of this question is to demonstrate how easy it is for us to be flexible when it comes to a friend, while at times we tend to be more rigid with ourselves. In therapy we will want to practice this ability until it becomes an internal “friend’s voice” to counterbalance our rigid inner self. The question “If this had happened to me, I would have thought…, and on the other hand I could have thought…” makes it possible to examine other thoughts besides our initial automatic thought. An event like: “My best friend didn’t play with me at recess” may lead to the thought “They don’t want to be friends with me”. But they can be taught to think “Even if they’re playing with someone else, that doesn’t mean that they are not friends with me”. Emos are pawns chosen by participants. Each Emo represents an emotion. Participants may choose the emotion according to what in their opinion corresponds to the facial expression on the circle or the matching picture on the game board. The question “If this had happened to my Emo they would say…” is about the connection between emotion and thought from a slightly different perspective. The goal is to recognize that emotions affect our thoughts and not just the other way around. A participant who chose an Emo of anger and got the event “My best friend didn’t play with me at recess”, may think: “That’s not fair” or “They are doing this to upset me”. An Emo of fear may provoke the thought “Maybe they don’t want to be friends with me anymore, and then no one will be friends with me”. While an Emo of calmness may trigger the thought “This is an opportunity to play with other children during recess”. The subject may be expanded by talking about how our emotions affect our thoughts; when I wake up happy, are my thoughts different than when I wake up sad? The purpose of the question “This thought goes through my head when…” is to understand that we all have automatic thoughts with which we interpret our reality. This question often allows participants to identify with the thoughts presented in the cards and thus we may get a glimpse of their inner speech. The question “A moderating thought that would work with this thought is…” deals with the connection between a negative thought and a moderating thought. A moderating thought enables us to moderate the extreme aspect of a negative thought. For example: the thought “nobody loves me” may be examined together with the participant. Is this a negative thought that may be moderated with a thought such as: “Some children like me and some children don’t”? This thought is not positive and it is important to understand that we do not intend to replace it with positive thinking, but to moderate the extreme or distorted aspect of that thought. If participants find it difficult to moderate their thought and cling to it, referring to their pawn and not directly to themselves will enable them to apply cognitive flexibility. Barlow and Heinrich’s transdiagnostic protocol presents this technique as the primary means for thought regulation. The aim of the question “When I think this way, I feel…” is to introduce the effect of thought on emotions. With this you may examine with the children whether they have similar thoughts throughout the day and what emotion do they experience. The phrase “This thought is typical of…” deals with the “voices” we hear in everyday life from people who are close to us. You may expand the discussion by examining whether the children use these voices themselves. How does this affect them? The phrase “This thought is not my best friend, therefore I can…” allows us to recognize that thoughts are merely thoughts and not reality – thus we may examine them rather than believe them. This allows participants to recognize that not all thoughts are true, and that we think many thoughts that do not necessarily reflect reality (in therapy based on the CBT’s third wave we deal extensively with the ability to examine thoughts as if they were on a conveyor belt or a leaf floating down a stream). The objective of the phrase “This thought correlates with the thinking trap of…” is to recognize thinking traps and link thoughts to their correlating traps. For this you may use the thinking traps strip and learn to distinguish between the various thinking traps. At the right stage of therapy, you may examine with the participants which thinking traps characterize them, and what type of thinking trap correlates with the thought on the card. If the time isn’t right to introduce the children to the thinking traps, you may simply help them identify which trap they think correlates with the thought based on its name alone. In the Emotions Detectives protocol, thinking traps are introduced in session number 6. The purpose of the phrase “I felt this way when…” is to allow participants to identify their emotions. Participants share events from their daily lives and thus we get to know their emotional experiences and examine what emotions they allow themselves to feel and what emotions they don’t like to experience. If a child says that they never feel that way, I recommend not to push for an answer and instead to let them take an alternative emotion card, and to note to yourself that they are experiencing difficulty in identifying or containing a certain emotion, and to get back to it later on. The phrase “When I feel this way I can tell myself…” deals with the possibility of using appeasing self-talk, which is not necessarily focused on mental change, but on one’s ability to contain the emotion. Examples for this type of self-talk may be: “It’s just an emotion that rises and subsides”, “I don’t have to fight my emotions” or encouraging self-talk: “I love myself just the way I am”. The phrase “When I feel this way I need…” deals with our ability to examine our needs, so that we may contain our emotions or regulate them. For example: “When I am sad, I need a hug” or even simply to remind ourselves of the sensation of a hug by a loved person. The purpose of the phrase “A thought that makes me feel this way is…” is to associate thoughts and emotions and emphasize the effect of thought on emotion. Make sure that participants form associations that make sense between thoughts and emotions. For example: a thought that may be associated with anger is “they are doing this to upset me”, while associating the thought “I have no friends” with anger is not a reasonable association since it would most probably not provoke anger directly but rather provoke loneliness or sadness. Of course, a child may think that they have no friends and that everyone is picking on them, and that thought may provoke anger but in this case the thought is comprised of two elements. Children’s ability to form reasonable associations is important for their process of self-regulation. The purpose of the phrase “This emotion helps me understand that…” is to recognize the role of emotions. The role of emotions is to help us understand what is happening around us and how it affects us. Every emotion has a role. For example: fear is meant to inform us of the presence of danger. But one must examine whether there is actual danger or whether it is only fear. Anger is meant to let us know that someone has stepped over our lines and we want to convey that message to them. Dealing with the role of emotions is a new concept for most children (and parents), therefore I recommend to examine with them how they would react to these emotions until now, and whether the understanding that emotions are there to inform them about something and help them – can help them contain it and not react automatically. The phrase “This emotion occasionally intermixes with the emotion of…” is intended to facilitate a discussion about mixed emotions since often emotions come together and occasionally they are even contradictory. Children find it difficult to accept this confusion and this is an opportunity to legitimize the concept of mixed emotions. Physical Sensations Cards – physical sensations experienced in the context of emotions. The purpose of the phrase “This physical sensation comes with the emotion of…” is to allow to identify physical sensations and their association with emotions. With this phrase you may facilitate a discussion about physical sensations and examine whether there are other instances in which we experience the same physical sensation other than with the mentioned emotion. Do we experience the same sensation regardless of emotions? Do we experience the same sensation with a different emotion? The purpose of the phrase “When I experience this physical sensation I think…” is to recognize that a physical sensation can also serve as an internal trigger, and a subsequent thought will interpret the sensation. Also, with basic (primal) emotions, physical sensations come before the cognitive processing since we are surviving beings, and our body prepares us for dangerous situations in any event in order to protect us from physical harm (such as a ferocious animal attack). Hence it is important to recognize that physical sensations affect our emotions and sometimes even come as a sign of an emotion we’re about to experience. For example, a quick pulse may provoke the thought “I am going to have an anxiety attack”, which will then lead to fear and intensify the physical sensation. The phrase “When I feel this sensation in my body I can tell myself…” may be used to generate a moderating thought for a physical sensation as well. You may say to yourself: “It’s just a natural primordial reaction” or “This sensation tells me that I feel… but I can simply examine it and it will pass”. This is an additional technique for physiological regulation. The question “Where in your body do you feel the sensation” allows participants to get to know the physical sensations they experience and then not panic as much when they occur. The phrase “This sensation reminds me…” links between the sensation on the card and the sensations experienced by the child. Participants are “forced” to recall different situations in which they experienced that sensation, thus facilitating a discussion about an emotion or situation with which or in which they experienced that sensation. The phrase “If this sensation correlates with your Emo, collect 2 tokens” allows to link the emotion represented by our pawn (Emo) and a physical sensation, thus expanding the link between sensations and emotions. Children who choose the Emo of joy or calmness often have difficulty perceiving the physical sensation that correlates with these emotions. This is an opportunity to discuss the fact that “unpleasant” emotions are mostly meant to help us survive and therefore our body prepares to fight, flee or freeze. “Neutral” emotions do not incite the body to prepare for the aforementioned actions and therefore we don’t experience the subsequent physical sensation in a significant manner. The phrase “The emotion that provokes this behavior in me is…” emphasizes the fact that emotions provoke behaviors. This phrase enables to identify the emotions that provoke the behaviors on the cards and to discuss the matter that while the purpose of emotions is to generate behavior, at times emotions may overwhelm us and we may subsequently behave in a way that does not benefit us in the long run. The phrase “If this behavior is effective for long-term move forward 3 squares” deals with the distinction between behaviors that are effective for the short-term (reducing the emotion’s intensity or avoiding it altogether) and behaviors that are effective for the long-term which help us cope with everyday emotions and situations. Behaviors such as avoidance, that stem from the emotion of fear, for example, are not effective for the long term, but certainly improve our circumstances in the short term. However, avoidance itself prevents us from dealing with the emotion of fear and from realizing that we can actually cope with it, and that things that seem frightening and impossible are not necessarily so in reality. The phrase “When I see a child behaving that way I know they feel…” was chosen based on the idea that often it is possible to identify a child’s emotion according to their behavior – a secluded child is likely to feel sad or hurt. However, occasionally behavior does not necessarily reflect a child’s emotions since children often use anger as an extroverted emotion, while feeling hurt or any other emotion they wish to conceal from their environment. This allows us to assert the fact that we can often identify someone’s emotion by their behavior, while occasionally the extroverted emotion is not necessarily the primary emotion experienced by that child. The phrase “Tell us about a time when you behaved this way” encourages participants to think of similar behaviors of their own, and facilitates a discussion about situations in which they behave this way. You may examine with the children whether this behavior reflects their emotion; Is it effective? Does anyone else in their family behave this way? This allows us to identify the child’s style of behavior and to jointly examine how this behavior serves their causes. The phrase “After behaving this way I feel…” facilitates a discussion about the fact that after we behave in a certain way, we experience an emotion which results from our behavior. Often, children who react violently or use bad language feel guilt or remorse, and children who avoid something out of fear will feel a sense of relief or disappointment. The phrase “This behavior is characteristic of…” helps us to recognize the style of behavior of people around us and to examine these behaviors “from a distance”, which often enables us to examine whether different behaviors are adaptive or maladaptive. The phrase “The negative thought that correlates with this thought is…” links between negative thought and moderating thought. Children often find it difficult to think of correlating negative thoughts and tend to come up with negative thoughts that do not necessarily correlate with the suggested moderating thought. This phrase enables a better understanding of how to properly match moderating thoughts. A negative thought that would correlate with a moderating thought would be similar but more extreme in nature. An example for a moderating thought: “I can do it”, matches the negative thought: “I can’t do it”, and not the thought: “I will never succeed”. The aim of the instruction “Repeat this thought out loud 8 times” is to practice moderating thoughts. This is based on the understanding that reiterating a thought will make it more available to us when we need it, since recently used ideas are more available in our short term memory. The phrase “This thought can help me when I feel…” facilitates a discussion about what moderating thought can help me when I experience a certain emotion. That is, the thought “I am great” will most probably be ineffective when feeling disgusted, but it may be very helpful when feeling disappointed. The purpose of the phrase “This thought is characteristic of…” is to allow children to identify a relative’s moderating voice. This may help you recognize the people who help the child moderate themselves thus providing a tool for them for emotional regulation. The phrase “This thought can be used before…” helps to recognize that moderating thoughts allow to regulate emotions before they are experienced at high intensities. It is important to explain to the participants that the use of moderating thoughts when overwhelmed by an emotion is ineffective. During an emotional overwhelm our ‘intelligent brain’ is inactive and our emotion-driven reactions take the lead. For this reason, it would be more effective to apply this technique before a situation that may provoke an unregulated emotion. The phrase “I would like to give this thought to… because…” raises awareness for children’s ability to help other people regulate their emotions, since one of our goals in therapy is to develop a capacity for empathy and the ability to acknowledge other people’s emotions. Playing CBT introduces children to the subject of emotional experience while linking the six stages of the process: event-thought-emotion-sensation-behavior-moderating thought. In addition, it enables therapists to considerably expand their knowledge of the patient. The various games included in Playing CBT provide a means to apply the principles of a specific element of the CBT model, to suit any stage of therapy. All games and options are detailed in the manual. You may also download additional game instructions from our website.